The three winemaking teams behind this month's selection are true artists in the sense of being capable of creating something new and wonderful from raw materials. Our selected artists all use the same colour for their work, the red Grenache, but different canvases. The differences between the diverse soils, altitudes, and climates in Madrid, Penedès, and Navarre makes each wine unique yet they still share some similarities. Agrícola de Cadalso, Indígena Red and Unsi Terrazas Red are three different works of art painted using the same colour but with brushes yielded by three different teams of excellent winemakers who have shown a masterly capacity to represent the natural elements behind each of these wines. Do you want to purchase individual bottles of this selection at list price? Club selections are delivered in the last week of the month. Contact us if you want to order additional cases. Go to your account to verify or change your delivery address and payment method. There is still time to receive this selection if you join now. No membership or registration fees. Get discounts and a great gift when you sign up. This magnificent single-variety Grenache wine is the result of a collaboration between the Comando G winemaking team and the Cooperativa Agrícola de Cadalso to recover old abandoned vineyards and give new life to the cooperative which, although it has a long history (founded in 1956), had not been doing so well when they started this project. But, in fact, this Grenache from the Cooperativa Agrícola de Cadalso is clear proof that cooperatives can produce top quality wines. It is a single-variety wine from the heights of the Sierra de Gredos mountains offering not just the character of Madrid wines, but also the unmistakable profile of Grenache wines. And all this at a very affordable price. A pale red wine with an intense mineral character, its aromas of red fruits of the forest mix with notes of scrubland in the nose. It has mature tannins and is easy to drink, with a taste embellished by aromas of plums and charcoal giving it a delicate and personal character. The finished wine retains a slight sparkling trace from its fermentation which, alongside its wild acidity, means that even though it has an alcohol content of 14%, it is by no means an aggressive drink. The aromas of its crispy fruit remain intact thanks, in part, to the vinification carried out in concrete tanks. A cool sensation of stones and dust wrap around the fruit providing elegance, and adding complexity and a degree of nobleness to this small but great Madrid wine. There are very few single-variety Grenache wines produced in Penedès, even though this grape is a traditional indigenous one from the Mediterranean area. 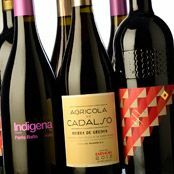 The Indígena wine from the Parés Baltà winery is designed to pay homage to these fresh, wild, tantalizing Grenache vines so commonly cultivated in the past. It is made with fruit from 14-year-old vines planted in loam and chalk soils 616 metres up in the Serra d'Ancosa hills. This poor mountain soil can be imagined in every sip, as can the intense sun this corner of Penedès enjoys. A juicy but fresh wine — very fresh, in fact. Its untamed acidity promises it can age exceptionally well, but also means we can enjoy this wine straight away, especially with the ideal food pairing. Perfect companions include any kind of meat, or even oily fish, with a good amount of protein and fat. The Indígena Negre is juicy and broad in the mouth; smooth with an extremely long finish. Subtle hints of toast from its short time spent in wood together with its roundness from the same ageing process produce a well-balanced honest and spiced wine with a good structure. Its dry finish reminds the drinker of grape skin and round off an unconventionally complex mouthfeel.